I had difficulty coming up with a tile for this maybe My Mom in on File with CPS or My Mother & Her Odd Ways – I think end with just simply – Oh My Mother. I think the funniest stories I tell about my mother is the fact that she was so overboard about her daughters always looking clean and put together. Before I tell you this story you have to remember I was probably 4 or 5 so it was back in the day. My mother left my sister, Melinda and I in the car while she ran into the grocery store. She specifically told my crazy sister to NOT OPEN THE DOOR. 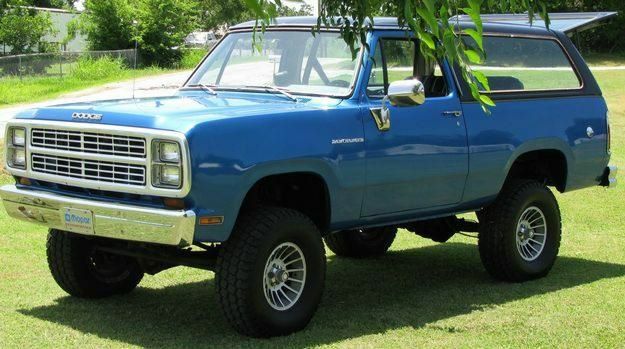 Wait I need to let you in on something – our car was a jacked up (like an extra foot) Dodge Ram Charger – similar to the picture below, but the wheels seemed a lot bigger – I was 4. I guess I don’t have to tell you that Melinda did indeed open that door while my mother was in the store, but she quickly closed it or attempted to. My mother got back in the car not knowing a thing – I was sure not going to tell her for fear I would receive a smack down from my older sister. Next thing you should know – my mother drives like a bat out of hell – she’ll admit to it. My mother took off back onto the small town black top road not noticing my sister clutching the door – that was not shut all the way – while sitting in the front passenger seat. My mother took a corner full force, that door swung open and Melinda flew out of the vehicle – I remember every moment of this accident. These were the days before seat belts – yes I am that old. My mother stopped the mammoth vehicle in a panic and I was just a balling. She ran and picked up her oldest daughter off the pavement – God was looking down on her, because she could have easily been smooshed under a tire. My mother put her in the car and took her home. Yes, home – not the hospital. Why? Well here is the funny story I always tell about my mother – she felt Melinda looked too dirty to take directly to the hospital, so she took her home, put on fresh clean clothes and re-did her hair. I think a good face washing was also included in it. Now instead of looking like she was in an accident, she looked like my mother had beat the tar out of her – this didn’t dawn on my mom and off to the hospital we went. My sister was examined and you guessed it someone from CPS was called in to interview my sister, me and my mother because Melinda looked a little odd, yes she was injured, nothing severe, but her ponytail was perfect and her face was shiny clean. You would think she would have learned her lesson, but a few years later it was my turn. I was injured in at a county carnival in one of those awful rides (which I will not let Shelby ride on) and before heading the hospital my mother – God Love Her – took me home, cleaned my up, did my crazy hair and then took me to the hospital. Again, we were all interviewed. I am not telling you this to say my mother was wrong – I think it is just hilarious how meticulous she was about our appearance in public. I love these stories, they make me laugh – they make my entire family laugh because this is so my mother – the women who cannot leave the house with a single wrinkle in her clothes, her face has to be perfect and her kids must always look the same. I love you Mom – even though I know exactly where I get my crazy from. I am happy to say that these two were the only major ER incidents that my sister and I had as kids and we survived without stitches. After Post Follow-up: I have to say I was kind of nervous posting this. When I called my mom to get the Model of vehicle we owned she said "What are you going to tell the world what an awful mother I was." I reassured her that that was not the angle I was going to take because first off everyone has these days as a mother and secondly she was NEVER an awful mom. Even after that I knew for sure I would get a snarky comment from someone saying how I needed to be nice to my mother - which I am now that I am in my 30's. I am relieved to find no snarky comments so far, so I thought this would be an awesome post to share on Momma Made It Look Easy. Go visit and see other awesome posts! That was hilarious and brought backo such good memories! No such things as seat belts, internet, push button anything..and yes appearance was everything! Great Post! I have no witty reply but OH MY! That is hilarious!!!! Did she make you put on clean underwear, too - just in case???? I love it! Thanks for the giggles. I was going to say that I can relate to the wanting your kids to look meticulous... but not that meticulous! That is so funny your mom went home both times to clean you and your sister up before going to the hospital. LOL! That is too funny!! I can't believe she actually took you guys home to get you cleaned up, haha! i agree, hilarious, insightful, and really really honest. im glad you wrote about her! This is hilarious! 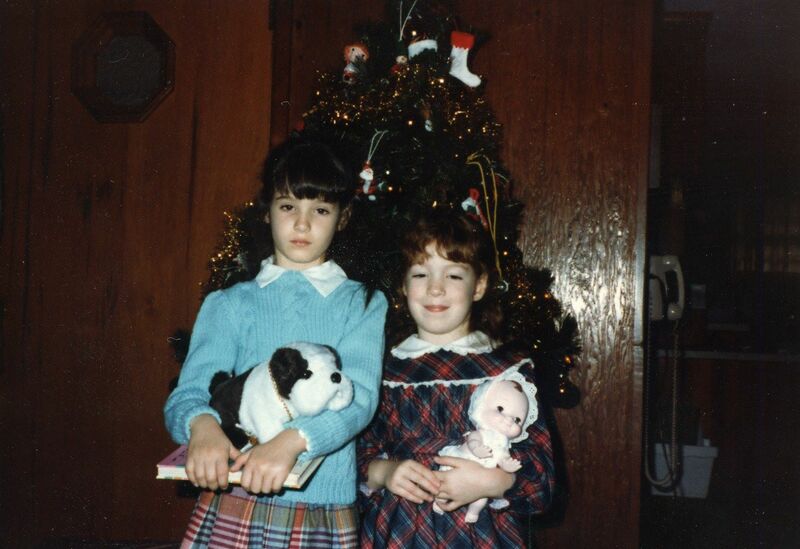 My mom was also meticulous about our appearance. Thankfully I never had to go to the ER to test whether or not she would do this.